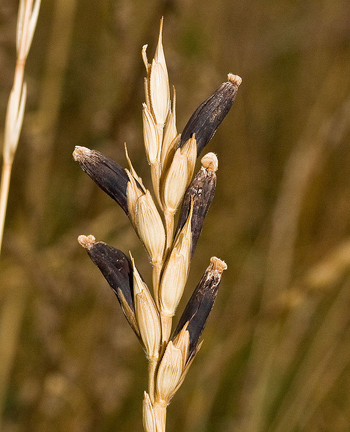 Ergot is a fungus which replaces the seeds of the rye plant (Secale cornatum). It takes the form of black or purplish-black, crooked grains or “spurs”, called sclerotia, about 3/4 to 1 1/2 inches long and 1/10 to 2/10 inch thick. It has a nauseous odor and a disagreeable taste. Found on fungus infected rye plants. As rye does not grow in China, true ergot is not found there. Medicinal preparations, such as ergotamine, are made from ergot; are useful in contracting the uterine muscles, particularly after delivery to prevent hemorrhage, and have also been used for menstrual difficulties. One ergot derivative, ergotamine tartrate, helps to relieve migraine headaches and cluster headaches by constricting the swollen blood vessels causing the pain. Ergot is also a source of LSD. Do not use without proper medical supervision.